Update: The Bundle is now over. The Humble Bundle store has a cool Linux Geek e-book bundle on sale, which includes $571 worth of Linux-related digital books for which you can pay what you want (starting at $1). There are multiple bundles available, depending on which books you need and how much you're willing to pay ($1, $8, $15 and $30 or more) and what books you need from each. The e-books bought through the Linux Geek Humble Bundle are DRM-free and available in multiple formats (PDF, ePUB and MOBI). Humble Bundle started as a digital store for games for which the price was determined by the purchaser. A percent of the price goes to charity, while the rest is split between the developers. The store expanded, and now includes a section for e-books, audiobooks and digital comics. And finally, for $30 (or more) you also get The Linux Programming Interface: A Linux and UNIX System Programming Handbook. Each bundle includes previous bundles, so for instance if you buy the $15 bundle, you'll also get the e-books included with the $8 and $1 bundles. Part of the fee you pay for this Humble Bundle goes to charity. At the end of the page you can choose the project to donate to (click the "Choose where your money goes" under the total price). 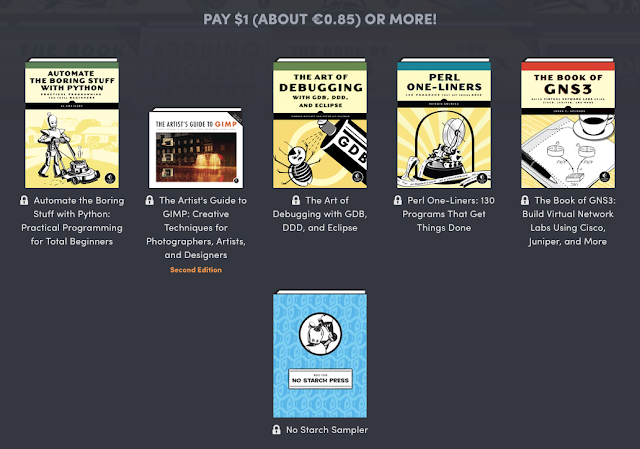 The Linux Geek Humble Book Bundle is available for purchase until the end of this month (July). If you're interested in the Amazon ratings / number of reviews for these Linux e-books, see this comment on Reddit (thanks /u/epakai).